Music plays an integral role in setting the tone for your wedding. You’ll have music at different points throughout the ceremony and the reception, particularly during the dancing portion of the festivities. When it comes to selecting wedding music, there are two especially important songs— the first dance song and the processional song. Discover how to pick your wedding song and ensure that it’s memorable and meaningful! The song that plays while the bride walks down the aisle is called the processional song. You can make things easy and go with the traditional wedding march, or you can shake it up and select a song that reflects your personality. Choose a song that fits with the theme and tone of your wedding. If you’re having an elegant wedding, consider an instrumental piece that’s more formal. If you’re aiming for a casual, fun wedding, feel free to choose a peppy piece of music for the processional. Keep in mind that the wedding party and the bride will have to come down the aisle while the piece is playing. You’ll need to choose something with a beat that’s right for walking or dancing down the aisle. You may have to test a few songs to see if their rhythms work well for the purpose. 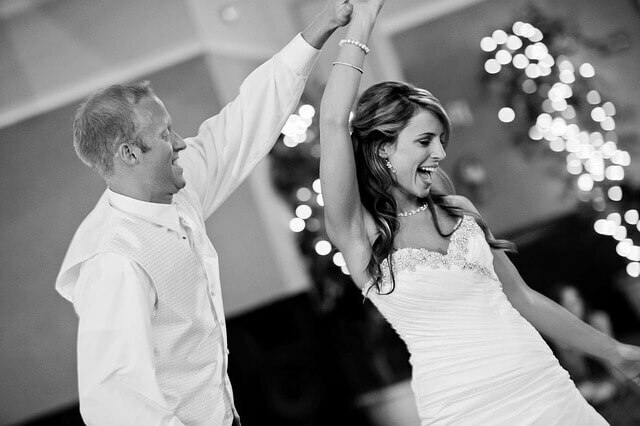 The wedded couple’s first dance is a special moment, and the song you choose should reflect your personality as a pair. It can be sweet and sentimental, casual and crazy, or somewhere in between, as long as it’s a song you both love. If you and your significant other have distinctly different taste in music, try to find some common ground. Is there one musical genre or style where your tastes intersect? Share each other’s playlists and try to find songs that you both enjoy. Obviously, the first dance song also needs to be danceable. It should have a rhythm that you’re comfortable with, one that suits your dance style. Many couples take dance classes before the wedding or recruit a friend or a professional to coach them on choreography and steps. It’s completely up to you— you can choreograph it or not, depending on your preference as a couple. However, it’s probably a good idea to run through the dance together at least once before you do it in front of hundreds of your closest friends and relatives. As you select a wedding song, keep in mind that people of all ages and religions will likely be at your wedding. You may want to avoid songs with explicit or heavily suggestive lyrics, or songs that may offend those of other faiths. Ultimately, the songs you select should make you and your partner happy— and if they put everyone else in a cheerful and romantic mood as well, so much the better! Remember to contact Nanina’s in the Park to schedule a venue tour and for help with wedding details.